- Paris-Brest: elegant Sunday dessert which includes Pâte à Choux (Cream Puff Pastry) filled with Praline Butter Cream. Brigitte was born and raised near Paris, France and comes from a family of caterers and pastry chefs. She loves sharing the joys of a beautiful French dinner experience. She is the owner of France Cuisine, a personal chef service in Ann Arbor. Brigitte, thank you, thank you for another marvelous class! You give us so much and you work so hard at this. 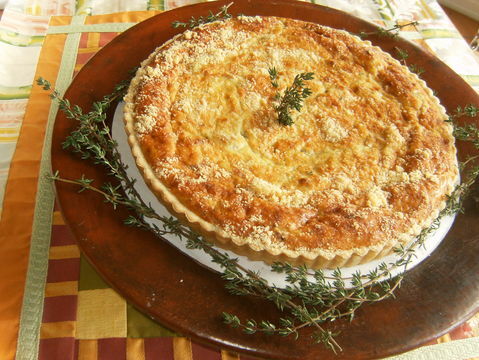 I found again the taste of the quiche lorraine my mother made and it was a pleasure. Your demonstrations are precisely done and they give us confidence to try it at home, literally. Bravo, Brigitte! Et merci! Brigitte, I can pick Elizabeth up, if you two are ok with that. Let me know. I can not wait!!!! Dear Bridget - Thanks very much! As long as there's a bus I'll be fine. Looking forward to it! Hi I would like to add another person, Terri Maxwell. When I selected 2 tickets, the price did not update. Let's see if Mijo can help us with that. In the meantime I will reserve a spot for Terri and will follow up on this with you. Thank you. okay. Can we pay for Terri on the day of the class? Hello Mary! I am going to check with the headquarters about this difficulty. If the system does not work, yes, you can pay for Terry on the day of the class. thank you for bringing this to my attention. Hi Elizabeth. Yes it is accessible by the AA bus system. line 1. There is a bus stop on Dhu Varren at the intersection with Pontiac Trail. Olson Park/Gretchen House is the area. My house is located in the unpaved section of Dhu Varren on the other side of Pontiac Trail. It is about 5/8 minutes walk from the bus stop to my house. I will be very happy to come and pick you up at the bust stop if you want to. Hello - is the location accessible by the Ann Arbor bus system? Thank you!